Sunshine Coast Airport continues to proudly support local businesses and industry with today’s launch of the Sunshine Coast 153º East concept shop, stocking a range of home-grown and hand-made gourmet food products, gifts, homewares, and skincare lines from selected local and regional businesses. 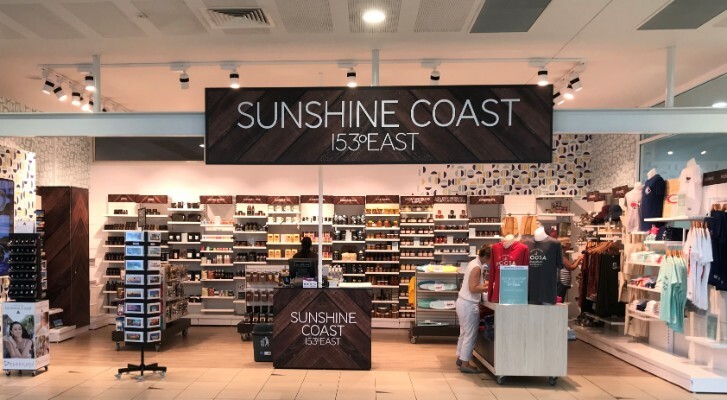 Sunshine Coast 153º East is named for the longitude line running through the Sunshine Coast and provides an opportunity to showcase what our beautiful region has to offer and features a curated and refined selection of products from around the coast. Sunshine Coast Airport CEO Peter Pallot said he was delighted that the airport could play a role in supporting local business with our concept partner AWPL. “We are not only delivering a world-class regional airport for our community, we are proudly providing a platform for promoting local producers and enhancing their exposure to the Sunshine Coast’s discerning visitor market,” Mr Pallot said. “This is a fabulous opportunity to showcase our very own Sunshine Coast products”. Natalie Thorogood, whose local bath and beauty business Soak Society is stocked at the new store, says tourist traffic past the store will provide significant exposure and growth potential for all the suppliers. “Visitors to the airport will be able to see our products on arrival and departure from the coast, so there’s a great opportunity for them to take a little part of the coast home with them. People like to buy quality local products when they travel, so we are delighted to be a part of that really positive mix,” Natalie said. Partner at Mooloolah Valley Honey Brett Murray is equally enthusiastic saying he feels that the quality of the store provides a great profile for the local businesses stocked there. “What better way to introduce a product to a wider market than with a great store like this, and when the new runway is finished we can really take our products to the world,” Mr Murray said.